There are a few exciting dining changes – and more – coming to a couple Disneyland Resort Hotels! At the Disneyland Hotel, Tangaroa Terrace is closed for refurbishment and will reopen in early 2019 as Tangaroa Terrace, Tropical Bar and Grill. Guests will be able to enjoy the tiki bar decor along with a new outdoor bar and “refreshed” patio. The menu will feature tropical drinks and Asian fare. A service window will also be added to the updated location where guests can get coffee in the morning and Dole Whip throughout the day. Over at the Grand Californian Hotel White Water Snacks will close and reopen later this year with an updated look. 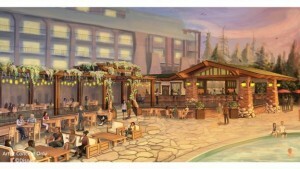 And, a new pool bar is opening next year at the Grand Californian!